On September 6, 2007 American Express and The National Trust for Historic Preservation announced its Chicago area grant initiative. Elizabeth Safanda applied for the grant. You Voted. We came in 2nd. Thank you for your votes! Pat Hansen, IOGT, Elizabeth Safanda, Preservation Partners of the Fox Valley, and Lorraine Straw, Norwegian National League at the Partners in Preservation Press Conference Hansen, Safanda & Straw at press conference. Preservation Partners of the Fox Valley wins Richard Driehaus award! Your votes carried us to victory! In November of, 2007 the Viking was awarded $52,000 by Partners in Preservation (American Express and the National Trust for Historic Preservation) for its stabilization and preservation. 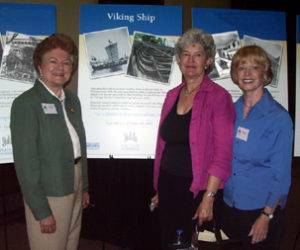 Friends of the Viking Ship is grateful to American Express & the National Trust for Historic Preservation for awarding $52,000 to the Viking. Partners in Preservation Awards Campaign poster. Share VIKING with your friends! 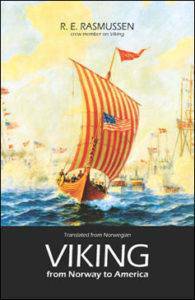 … a personal account by one the Viking‘s crewmen of his adventures before, during and after the historic voyage from Bergen, Norway to Chicago in 1893. $24.00 inc. shipping & handling within the USA only. Order now with this form! Friends of the Viking Ship, NFP is a 501 (c) (3) not-for-profit corporation, incorporated in August 2008 to work toward the preservation, public display & permanent home for the Viking ship.